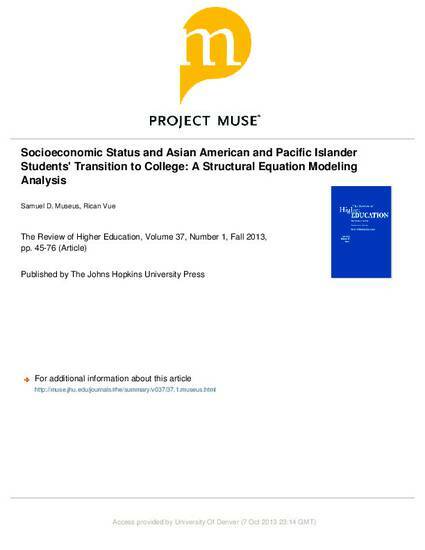 The purpose of this study is to examine socioeconomic differences in the interpersonal factors that influence college access among Asian Americans and Pacific Islanders (AAPIs). Data on 1,460 AAPIs from the Education Longitudinal Study (ELS: 02/06) were analyzed using structural equation modeling techniques. Findings suggest that parental expectations, parental involvement, teacher quality, and peer academic orientation were associated with more positive transitions to college among AAPIs but that the nature of those relationships was complex and varied across socioeconomic statuses. The authors discuss the limitations of national databases in studying AAPIs and offer implications for higher education research, policy, and practice.